If you will be coming into the shop to pick up your monthly kits, you may do so on the second Monday or second Saturday of the month to receive your discount (otherwise, you can come in any other day to get the kits at regular price). 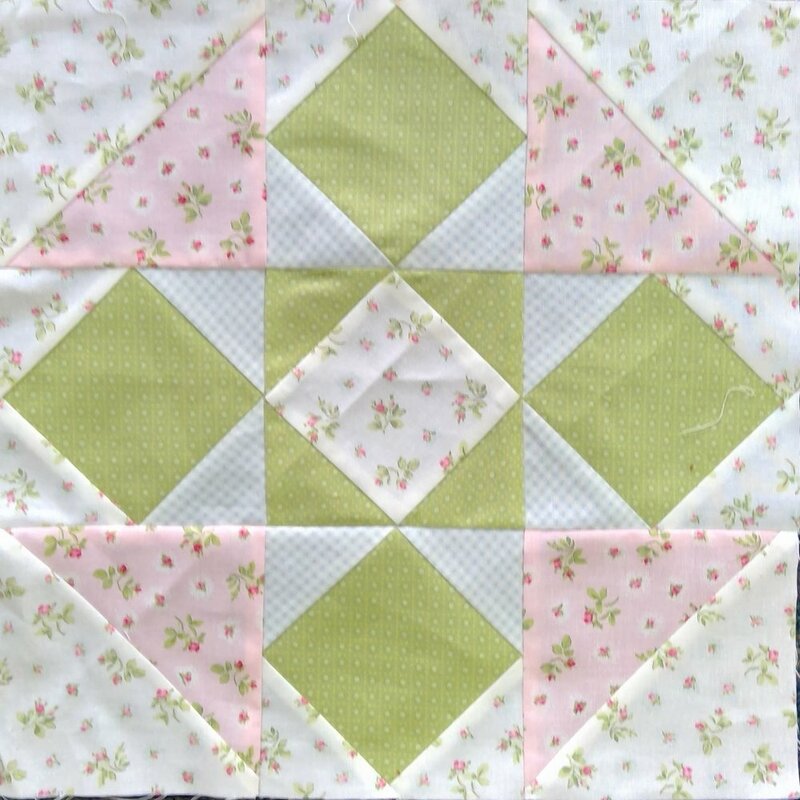 Tender florals and soft pastel colors will give this quilt an elegant shabby chic look. The name says it all -- charming, feminine, and sweet as can be! 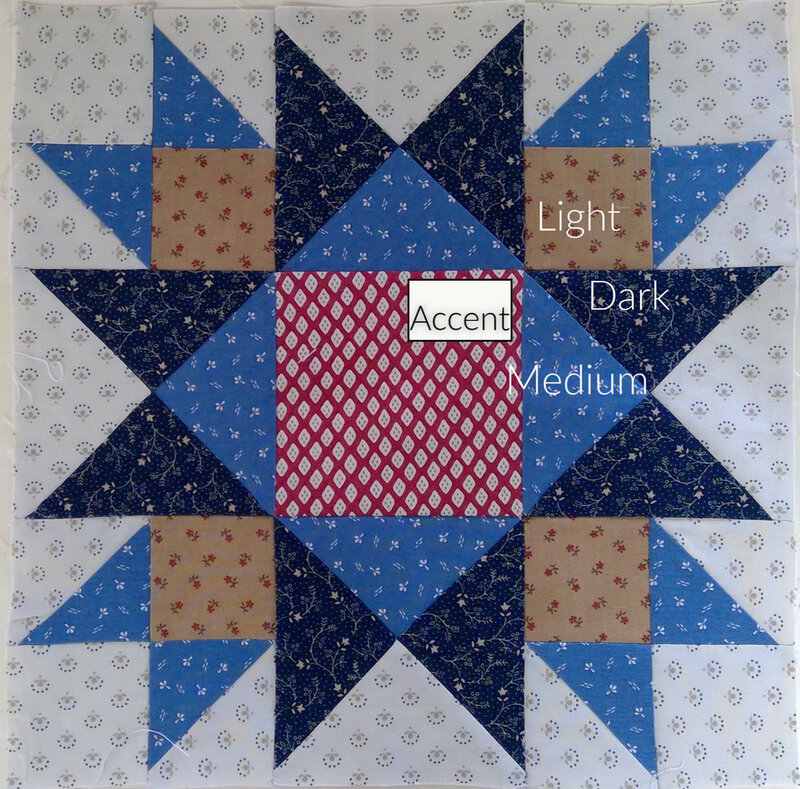 In true patriotic Americana style, this quilt will incorporate various red, white, and blue shades: blues from some reproduction prints, and a touch of red now and then. 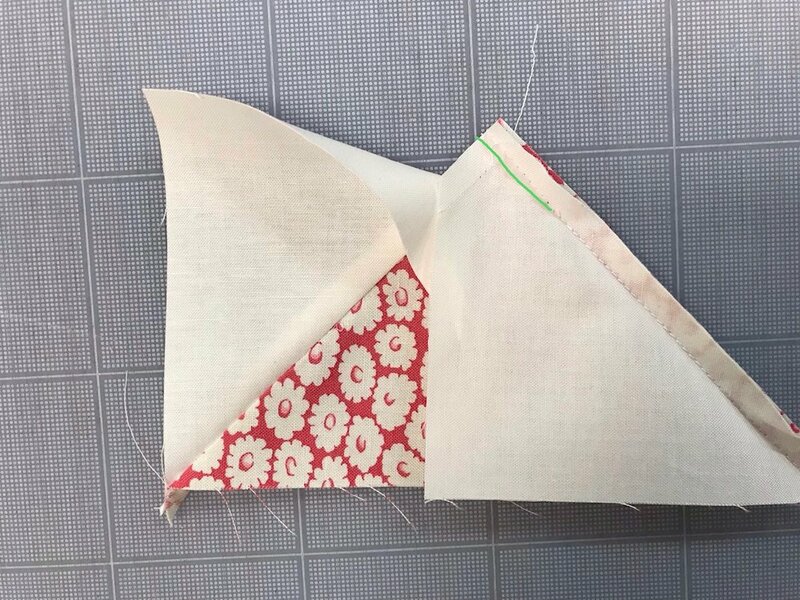 Each block will be set in a background of scrappy shirtings to complete the timeless vintage feel. Bright Kaffe Fassett prints paired with Bella and Paintbrush Solids, and a gray solid background for each block. You can be sure this quilt will have a modern flair and a be colorful feast for the eyes. We're taking sign-ups now for The Music in Me, but the first kit will be ready Saturday, September 8 and Monday, September 10. Buy the first kit before October 1 and it will be $3.50. Here are the Prairie Point Block Party guidelines: You may come in the shop on the second Monday or the second Saturday of each month. The blocks will cost $3.50 for your first block and the following 11 months if you personally bring in your completed block (from the month before) on "Block Party day". 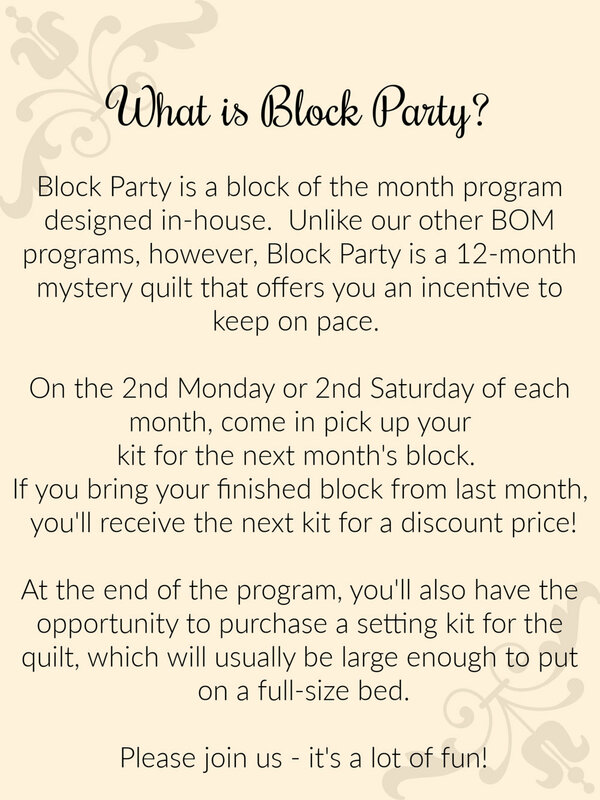 If for any reason you cannot come on Block Party Day the block kit will cost $5.50. A mail order option is available for out-of-towners. Call the shop for details: (913) 268-3333. September is the first month with a beautiful star block. The Tucker Trimmer is wonderful for squaring up the quarter square triangle units. Let us show you how it works, or use your usual Creative Grids square ruler. Kits are $5.50, but if you bring this finished block in October 8th or 13th you will get your next kit for $3.50! October — The Folded Corner Clipper works great for the flying geese technique shown on this month’s pattern. Just two colors plus background this time. We’ll make up for that later! 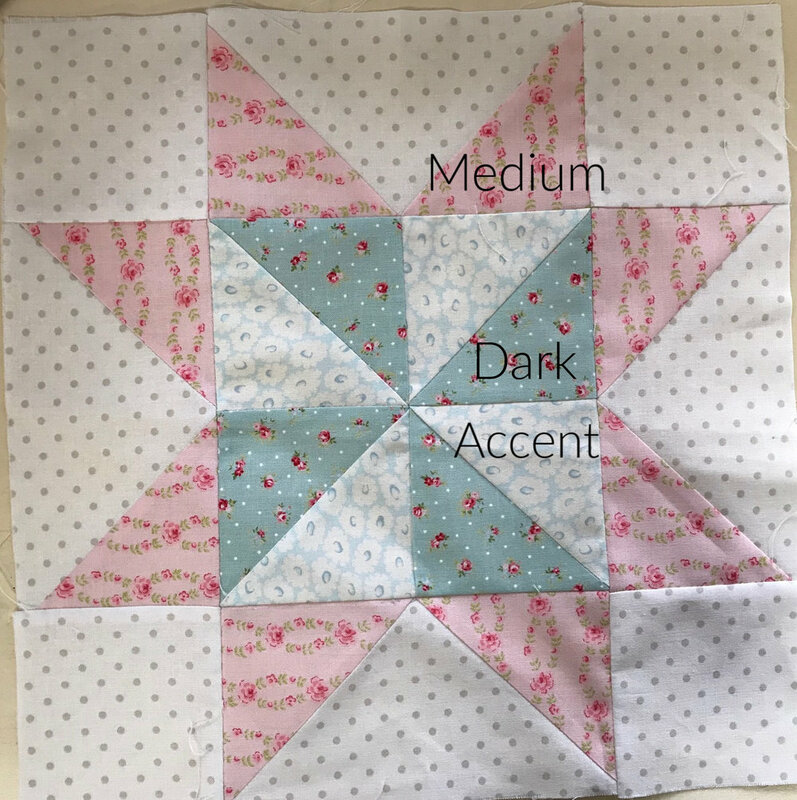 For Sweet Caroline, we made some fabric substitutions; if you want the blue to be in the placement as shown in the block below, be sure to use the blue you were given as the dark. Many times medium and dark are arbitrary in these blocks. November — Bloc-Loc and Square Squared here. Notice how all three blocks look so different. It’s color placement. We didn’t intend for the differences, but that is the way it came out by the colors and placements we chose. 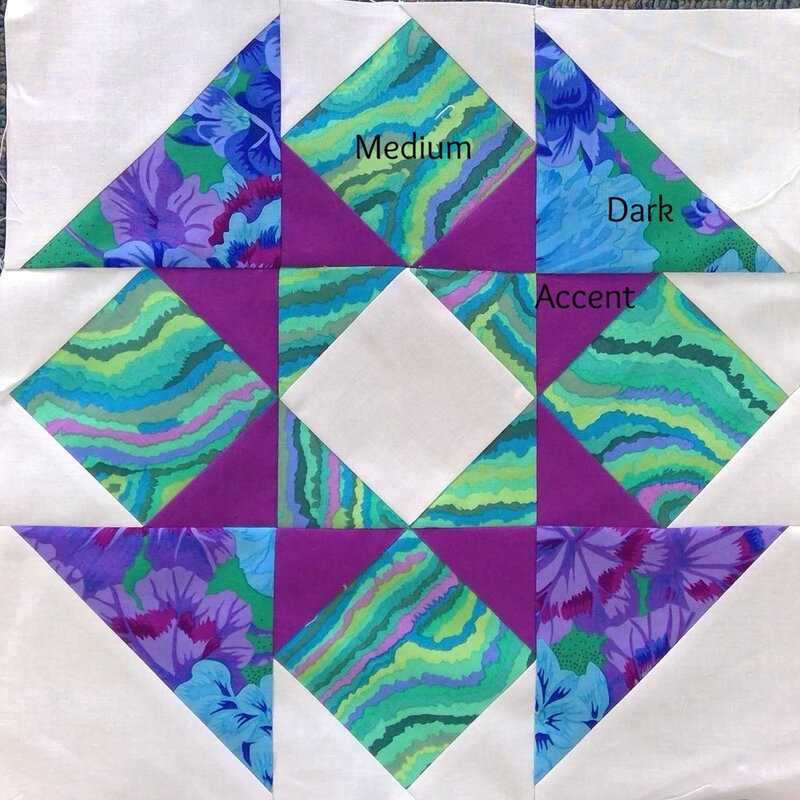 CORRECTION TO NOVEMBER BLOCK — Step 3. 3. Place the 5” background squares on top of the dark squares, right sides together. Stitch ¼” on both sides of the drawn line. Cut on the line. Press toward the light triangle. Square unit up to 4½” . December — Accuracy in cutting and piecing is important. 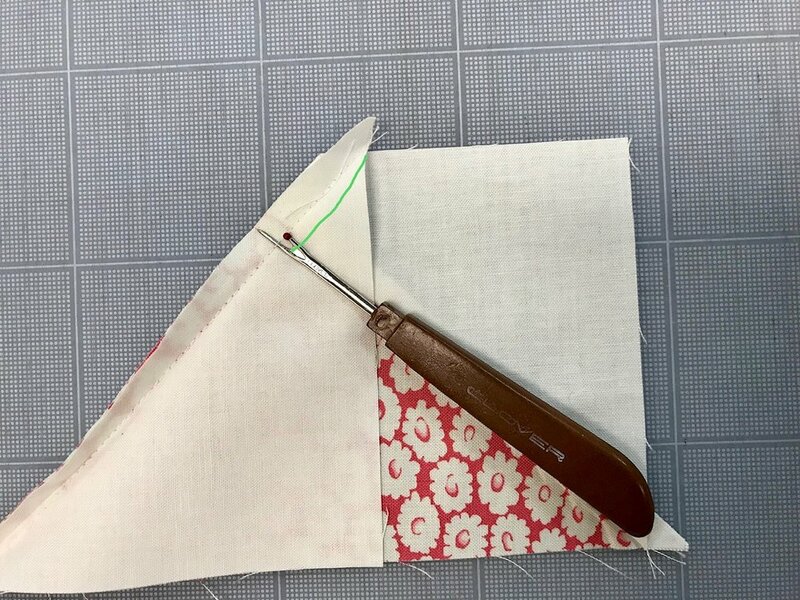 Use a good rotary cutter, watch the lines on your ruler closely, and be sure your 1/4-inch seam allowance is accurate. Press seams. Another tip that is meaningful here: “dark” does not always mean the print is darker; as you can see, “medium” might be darker than “dark”. It’s all about placement of the prints, especially when working with three color-ways. January — Wow! You have four prints plus the background this month. We are going all out here! This is a fabulous block. Use your Tucker Trimmer and Bloc-Loc if you have them. February — You can’t get much easier than this. Do you have a flying geese ruler like Bloc-Loc Flying Geese, Creative Grids Ultimate Flying Geese, or Wing Clipper from Studio 180? If not, see the link below for tips on squaring up with your straight ruler. 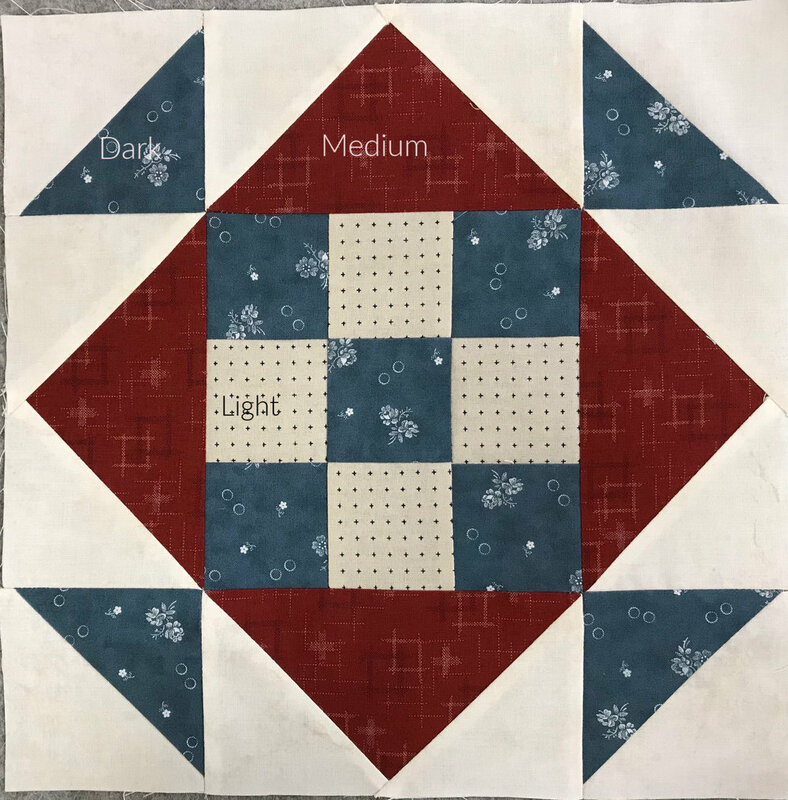 How to square up flying geese units without a special trim tool — This demo is shown for the 3 1/2” x 6 1/2” geese units because that is what is made for this month’s block. The same principle applies for any size. March — Bloc-Loc helps with the outer corners. Use your favorite flying geese tool for squaring up the geese units, or see the tips in the link above for doing this without a special trim tool. As always, let us know if you have any questions, need any help, and want to see a demo in the shop. Oops! 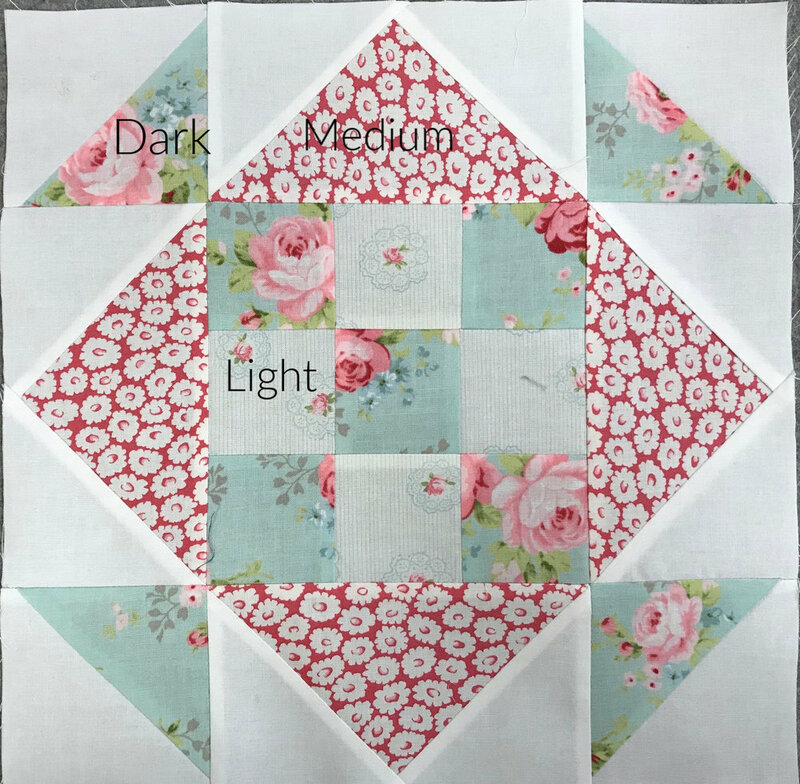 We found an oops moment — If you have not cut your medium square yet, cut it 7-3/4” instead; then continue with the instructions. If you have cut it you may find when you go to square up your units that you have an extra little piece in there you don’t want. This is caused by the goose square not being large enough for the smaller squares. Sorry if you have to make adjustments because of our misprint :( but it is fixable. Let us know if you have any questions. Remove the stitches as shown. Pull that section back and remove stitches on the other side. Then you can remove the little piece that was in there. Lay the lower section where it belongs and re-stitch. Press back and lay other side down and re-stitch. Press unit, then square up using your preferred method. 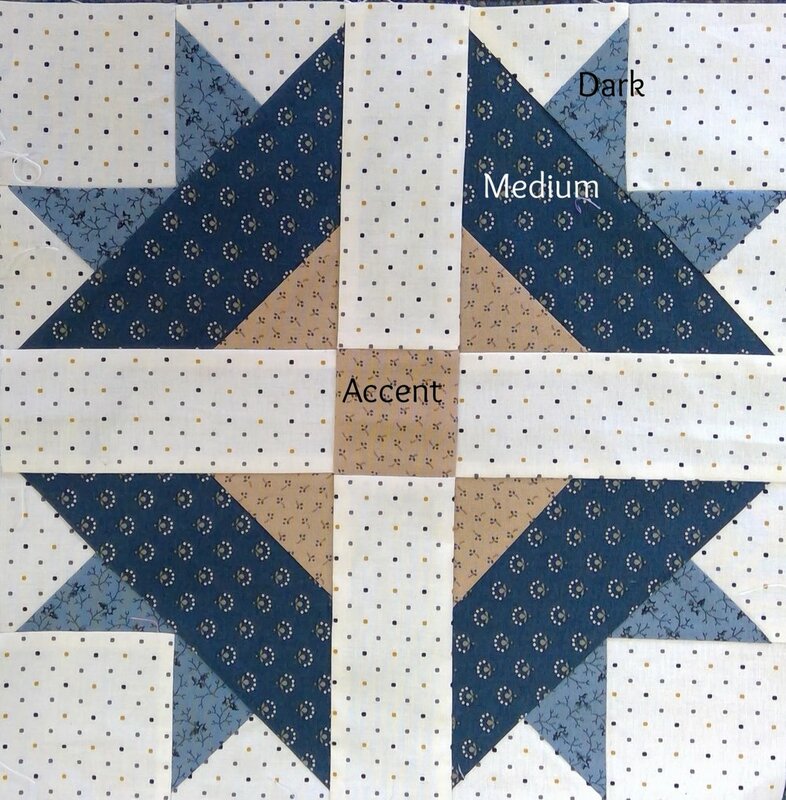 Special tools are not required for any of the blocks, but can help make your block units turn out more precise and accurate, and it is a great way to learn these techniques for your future quilting projects! Remember, each block should measure 12-1/2”; if it doesn’t, there is a reason. We can help you figure that out. 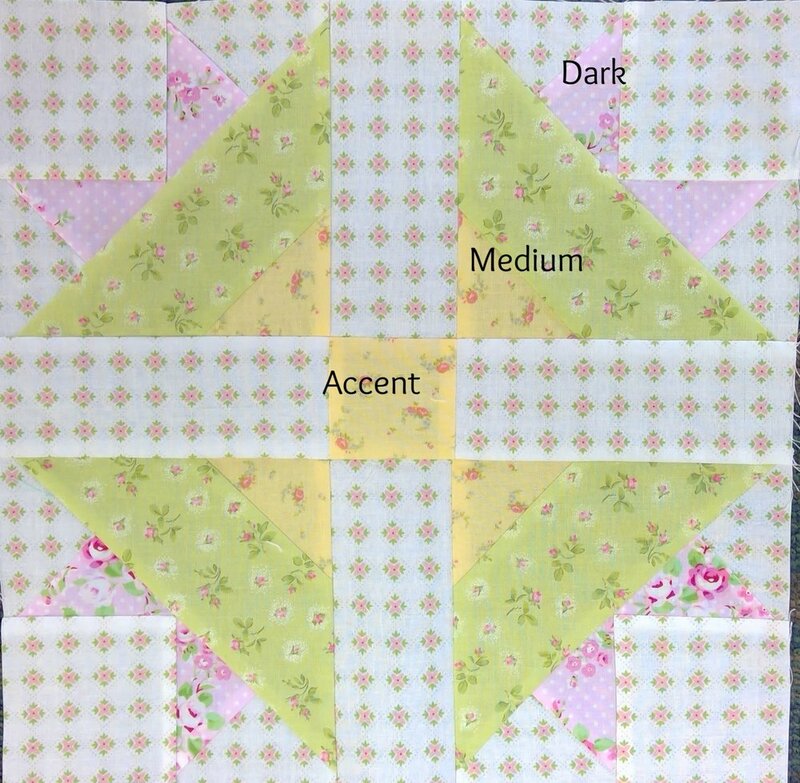 April — Just get your half-square triangles squared up and sized just right. Got a Bloc-Loc? Tucker Trimmer works well, too.